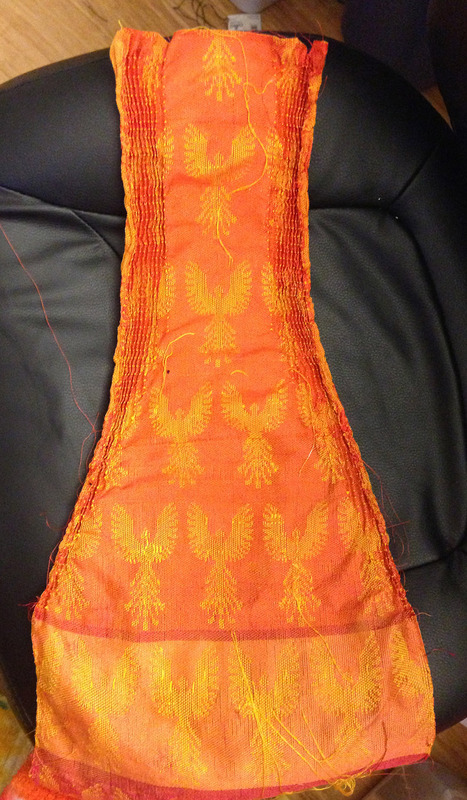 My conclusion from this sample is that I don’t want to use the phoenix crimped cloth in the dress design I’ve chosen; the crimped parts are coming out wider than I’d like, and the crimp distorts the flat portions fabric. Also, the polyester isn’t as drapey as the silk, and it feels like, well, polyester. 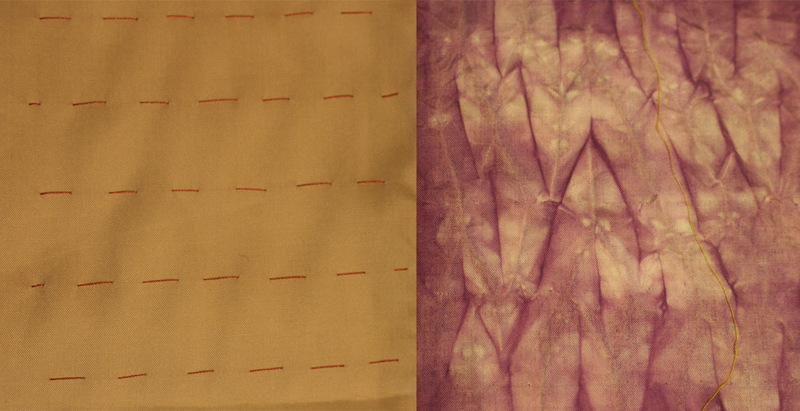 Still, the result is pretty, and I might use it if I make a scarf or something, to add visual interest to the scarf. I may use it in my entry for the Pikes Peak Weavers’ Firestorm show. I also want to play more with airbrushing on warps – it was fun to try (and I got to try out my new airbrush!) but I need more warp showing if I want to get good results. Something to try on another warp, I guess! Many thanks to everyone for the comments on my last post – it’s been a tough few days, but we’re getting through. I loved that cat so much! and it’s so hard to say goodbye, even when you know it’s the best thing you can do for him. I wish cats lived as long as humans (though if they did, there would be more orphaned cats, so maybe not…). Anyway, life goes on despite our grief, and we go with it. In this particular case, it goes to Diane Totten’s crimp cloth workshop, where yesterday I wove two lovely samples on my metallic gold polyester thread warp, and finished another sample today. 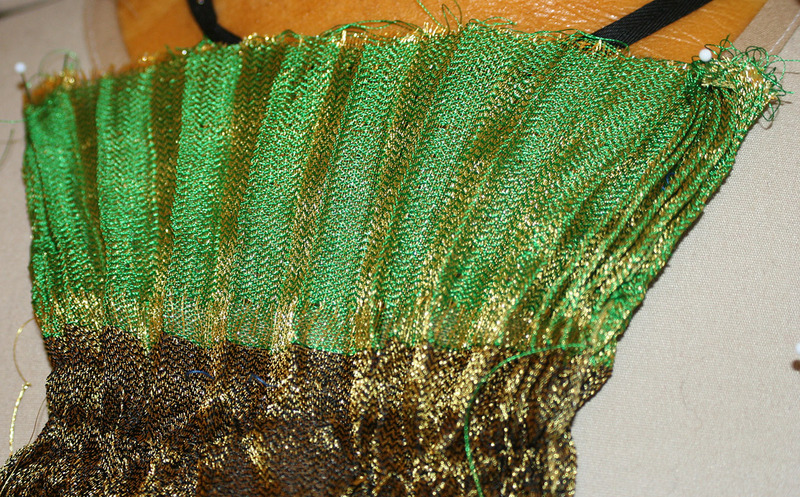 This sample is weft shibori on a metallic gold polyester thread warp, using a polyester embroidery thread as weft (green and black). The ties are pulled tight and the piece is steamed, which permanently sets the polyester into pleats. So what was I trying to accomplish with this sample? Mainly, I wanted to see if I could get godets (triangular inserts into a garment, producing a flared ruffle) without sewing. 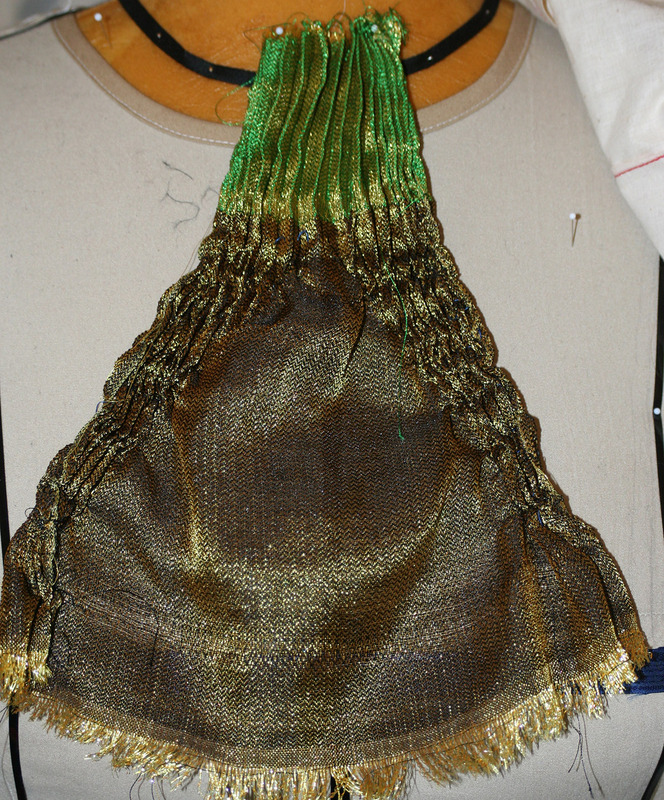 So I wove the temporary threads (used for pulling the garment into pleats) into either side, gradually decreasing the center, until I had a triangular insert of un-compressed fabric inside a large rectangular piece that was pulled into folds. Then I pulled the threads tight, steamed, and voila! A triangular ruffle, of sorts. The sample is too stiff for what I have in mind, but the concept seems to work well enough to be worth further exploration. If I use a silk warp and a very fine polyester embroidery thread as weft, I could make a much more supple version, for possible use in Phoenix Rising. And just what am I planning for Phoenix Rising? You’ll notice that the light gray stripes flare dramatically into the skirt at bottom, while the black stripes flare only slightly. I could do that with flat fabric, of course, but…what if I created the flare with crimp cloth? 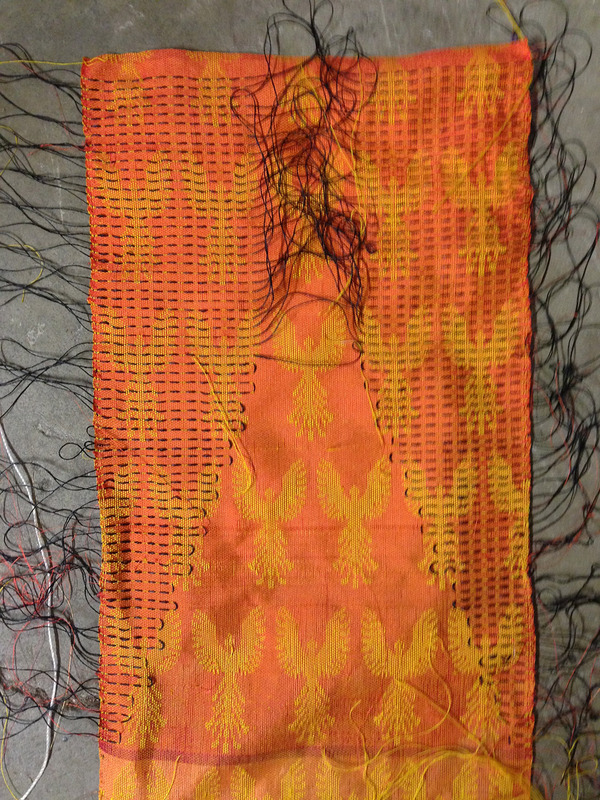 …and, what if I wove the phoenixes into the crimp cloth, so they appeared and disappeared depending on how the fabric was pleated? I’m not sure how this all plays out yet, but there are tons of interesting ideas to play with here – enough to keep me busy for quite awhile. I definitely need to explore this further! woven shibori experiment - diamonds, white on one side (and thus black on the other), superimposed on a two-color square "grid". woven shibori experiment - diamonds, alternating white and black, superimposed on a two-color square "grid". 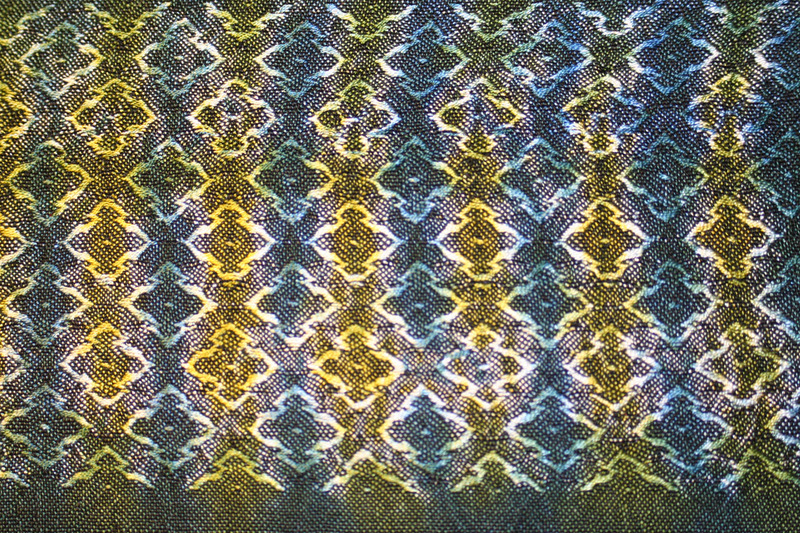 woven shibori experiment - diamonds, alternating between white and black in rows of 3, superimposed on a pattern of solid color and halftone, also alternating in rows of three. I’m not especially thrilled with the results of this experiment, as the diamonds really aren’t very visible in real life (the camera flash makes them stand out a LOT more than they do in natural light), and also because I feel they’re disruptive when they do.Â The stark grid of the diamonds, and the strong geometric shape of the diamonds, clashes with the irregular and soft “lines” of the dye pattern. 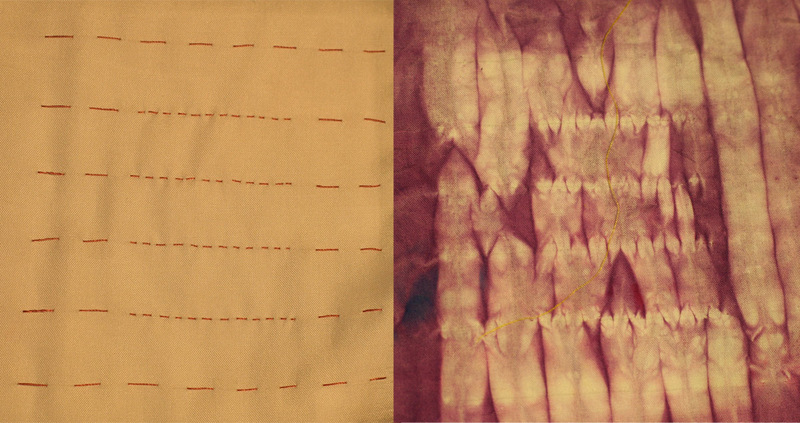 It’s better if the pattern woven into the cloth is more fluid than geometric – because otherwise the irregular, shaded borders from shibori will clash with the clean, sharp edges of the woven pattern. 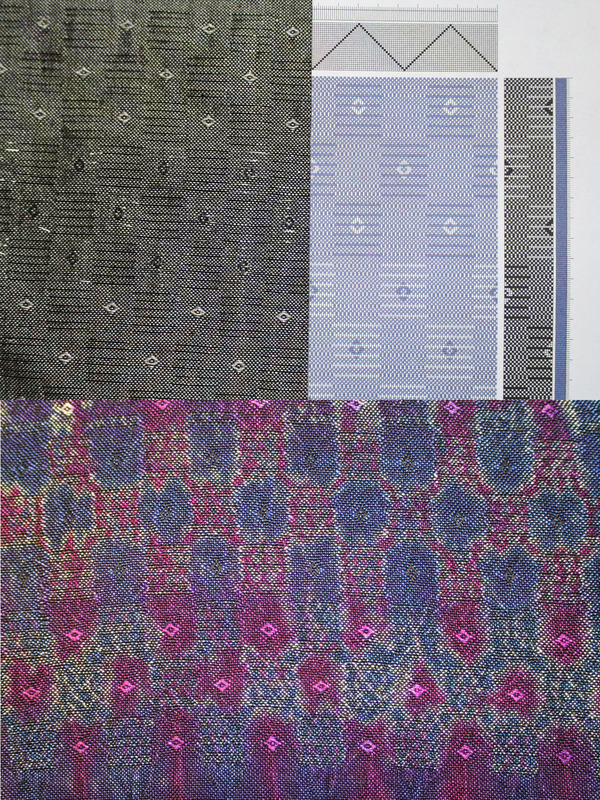 The more complex the shibori pattern, the simpler the pattern woven into the cloth should be.Â And vice versa.Â Otherwise there’s simply tooÂ much going on at once. Subtle shading with less contrast is more restful to the eye than high-contrast combinations. 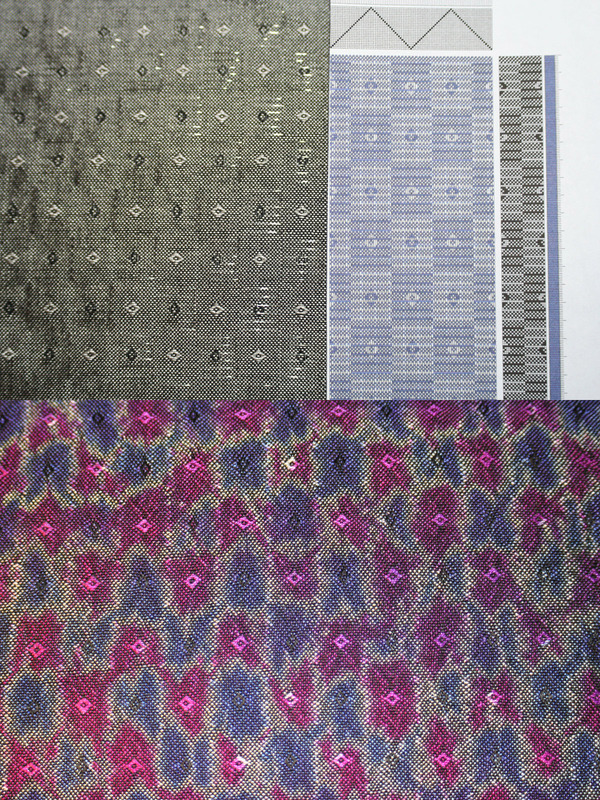 I would say that the top photo (the “bottom” side) is the most successful of the samples I’ve done.Â The low contrast is restful to the eye and prevents the “busy” pattern from overwhelming the design.Â (The second photo of the sample has much higher contrast and hence looks busier. 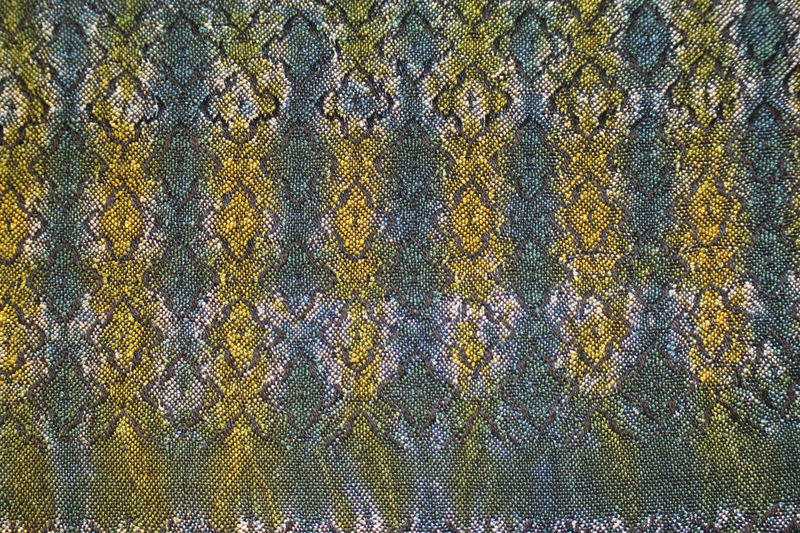 )Â The slightly curvy edge of the diamond pattern works well with the diffuse edges of the shibori pattern, and the shibori pattern is both simple and gradual in shading, complementing the woven pattern without competing with it. Now, where next?Â That’s a complex question.Â I am rapidly coming to the end of my warp, and am battling between the urge to get an actual finished piece out of this 11-yard warp and the desire to keep on experimenting.Â (Yes, I have just about used up an entire 11-yard warp in sampling! )Â Compounding things is my guild challenge for this year, which (if I’m going to enter) needs to be woven up this month for the December meeting.Â Since chocolate season officially starts on Saturday, that gives me four days to weave it, if I’m going to.Â Which in turn means it must be woven on this warp, since there’s no way I’ll get another warp wound, threaded, etc. in timeÂ for the challenge.Â So I am torn between “weaving something” and continuing to sample. Unfortunately, I don’t feel any of my woven shibori experiments have been successful enough to weave up into an actual project, so unless I abandon woven shibori, I won’t have a piece I’m satisfied with for the guild challenge.Â And somehow it feels like cheating to abandon woven shibori for something safer and more familiar. 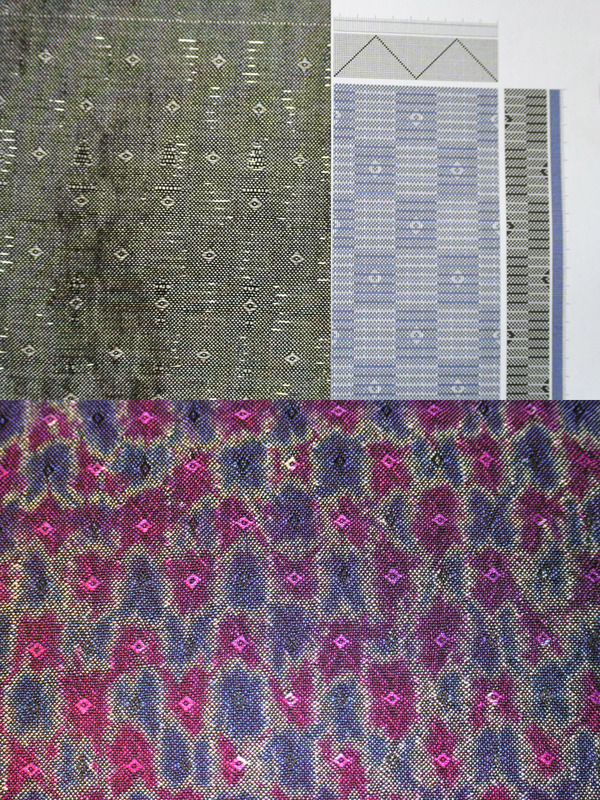 I think the eventual outcome of all this is that I will not enter the guild challenge, or else will figure out how to convert one of my samples to an “actual project” for entry.Â I’m so interested in how this woven shibori stuff turns out that I really hate to stop what I’m doing and do something else! And that doesn’t count the 1.5 quarts of candied citron that I put up in jars today.Â I think that once all the shouting is done, I’ll have about two gallons of freshly candied citrus peel.Â What does one DO with all that?Â Well, let’s see, there are the neighbors, the neighbors’ friends, the coworkers, the coworkers’ friends, that houseful of drug addicts down the street…surely some of them would appreciate some candied citrus?Â Sort of like zucchini? Once that’s done, next weekend will be fudge time.Â This year I’m shaking things up a little bit.Â I’m going to keep the white chocolate lavender Meyer lemon fudge, because that’s my personal favorite, and I’m going to keep the coconut tequila lime fudge and the chocolate-dipped coconut almond fudge, because those are Mike’s favorites.Â (There are advantages to sleeping with the chef! 🙂 )Â However, the chocolate macadamia fudge is going bye-bye for this year, to be replaced by chocolate cherry fudge with almonds.Â It’s an adaptation of one of my all-time favorite chocolate confections, cherry almond clusters.Â I came up with the formulation shortly after graduating college – it’s very simple, just mix dried sour cherries and almonds with tempered chocolate and drop onto trays in spoonfuls.Â It’s simultaneously tart, sweet, chewy, crunchy, and chocolaty – heavens, what’s not to like? Alas, the clusters are too big to fit into today’s chocolate boxes (a single cluster takes up the space of 2-3 bonbons), but I’m hoping to reincarnate them in a fudge recipe.Â Â If nothing else, it will be a pleasant break from chocolate macadamia fudge, which has also been a mainstay for several years. The last of the fudges is going to be maple walnut or maple pecan fudge, which I realize is practically a cliche, but I’ve never made it before, and I’m the chef, so I get to do what I want.Â (Insert a cheerful “nyah, nyah, nyah nyah nyah!” here. )Â I’ve been trying to think of a “twist” to make it more original, but then, there’s a reason that things get traditional.Â They work!! So I may just make it “straight up”, without edits. After that, which will occupy me most if not all next weekend, I will go to work on the caramels, toffees, and candied citrus peels.Â This is where the chocolate tempering machine comes out.Â For caramels, I’m only planning the traditional chocolate covered jasmine – vanilla – orange blossom honey caramels.Â These have appeared in every chocolate box since time immemorial, and probably always will, because they are my favorite item in every box.Â I love these.Â I could eat entire buckets of these.Â You couldn’t pay me enough to not make them.Â Yum! Here there are diamonds in the center of each of the squares that will be a solid color once the cloth is dyed. I plan to get started on this tomorrow, but am not entirely sure whether I will get around to it.Â A friend from Colorado is visiting family in Sacramento, so I’m going to drive over there tomorrow and visit her.Â It’s a 5-hour round trip, so I might be too tired to weave by the time I get back.Â But I hope not – I’m dying to see how this new draft weaves up!